Description of a social event the entire Downey family attended. 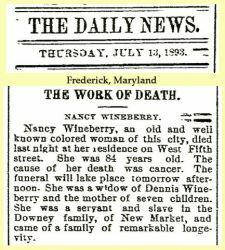 The Daily News, Frederick, Maryland. 24 Aug 1894. In 1866, after the Civil War, he began to read medicine, studying with two doctors before graduating from the medical department of the Universty of Maryland in 1869. He returned to New Market where he practiced medicine. He was a life long Democrat. Member of Medical Society of Frederick County. Offices held: Pres., 1906. Assistant Surgeon, rank of Captain, 1st Regiment, M.N.G., 1893-98. The Frederick County, Maryland, 1878 Directory lists Jesse W. Downey as a physician in Frederick City.